Dave won’t be watching it with me. I won’t say it has anything to do with being squeamish. I just won’t say anything. But I LOVE it! 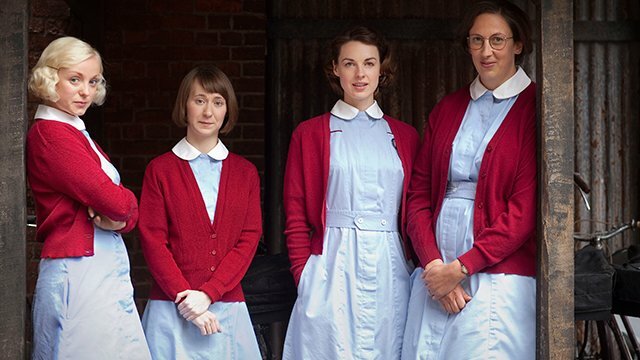 Call the Midwife, written by Heidi Thomas and based on the best-selling memoirs of the late Jennifer Worth, returns for a second season. Nonnatus House opens its doors to warmly welcome the audience back into 1950s East End London and continues to follow Poplar’s community of exceptional midwives and nursing nuns. Season 2 stays true to the show’s roots — viewers can expect to see more births, babies and bicycling, plus blossoming romance from an unexpected quarter. I saw this title on Netflix the other day. Because you gave this great review, I watched an episode. Yes, I will watch all the episodes Netflix has to offer (6, I think). Sooo good…the setting, the time, acting, dialog, story, and especially the subject, BIRTH! Thank you. Oh, yay, Dawn! Of COURSE you love it with me! It is great – every single episode and I believe the new shows start on PBS this coming Sunday night!